This is a pro bono sponsored post. I refused payment for this post due to my passion for helping others with cancer and I fully support this non-profit. Did you know that this year, more than 1.6 million people in the US will be diagnosed with cancer? My father beat stage 4 colon cancer seven year's ago, my maternal grandmother beat breast cancer and so far, my middle daughter's favorite teacher from another school continues to beat her breast cancer. Cancer is a part of our life and one of the things we do to fight back is to volunteer our time. From participating in walks and activities that support walks to giving to efforts that provide smiles and comforts to children with cancer. We have our own non-profit in which we deliver to children with asthma and epilepsy but last year, we delivered specifically to children with cancer at our local hospital. Giving back is something that each and every one of us can take pride in doing and I believe teaching kids early is essential. This is why the Giving Comfort program is something that is very near and dear to me. Giving Comfort is a non-profit program of the McKeeson Foundation. It all fits inside the full size back pack and is just adorable. The stuffed monkey is of high quality along with the rest of the products. As soon as I received this, I told all my friends especially on Facebook because I have a lot of friends who work with children with cancer to spread the word about this wonderful non-profit, Giving Comfort. 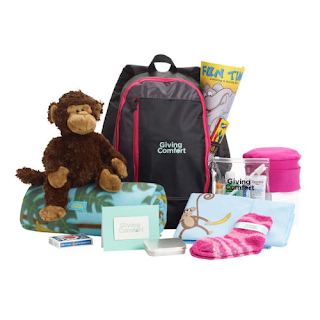 There are kits for boys, girls, men, women, teens as well as caregiver kits. Everyone is covered and if you know how devastating and draining cancer can be which is why I also love the men's and women's Harmony and Tranquility Kits. These kits are created based on providing comfort your loved one with products that they will enjoy and use. Even if you don't know someone personally with cancer, purchasing one of these and donating them is such a wonderful way to give back. These kits will let your loved one or adopted stranger that they are not alone. From my experience with my father fighting his cancer, he didn't talk about it. He did keep his sense of humor and rarely complained. I still remember him mowing the yard at the age of 71 while undergoing chemo and radiation post surgery. He was a trooper but I'm sure he struggled inside because he confides in me that he's not ready to go yet. I also have experience seeing children with cancer embracing gifts they receive from others and can see the smile in spite of the pain they are enduring with their treatments. Nothing is more special to a little one than receiving a gift unexpectedly. To learn more about Giving Comfort, please click on the link. *Disclosure: I did not receive payment for this sponsored post. The opinions are of my own. I did receive a complimentary Giving Comfort kit that I'm donating to my local Ronald McDonald House to give to a child with cancer.